At Northern Arizona Service Dogs, we are committed to helping people obtain a service dog in AZ that helps aid them in their daily lives and thus, enhances their overall quality of life. We also help train and place service dogs with deserving owners throughout the United States. We are currently in the process of making our adoption applications available online, and we welcome you to check back periodically as this page evolves to offer more interactive abilities. For the time being however, if you would like to apply for a service dog in AZ or anywhere nationwide, please contact us so we can help you with the application process at info@northernazservicedogs.com, or please fill out the form on this page. We are also happy to help you learn more about sponsorship or scholarship opportunities you may qualify for. Additionally, we welcome you to call us on the phone at (928) 288-2216 for assistance with the application process, as well as to ask any questions you might have about ownership or service dogs in general. For more information about Arizona law regarding service and support animals where housing and public accommodations are concerned, please click here. 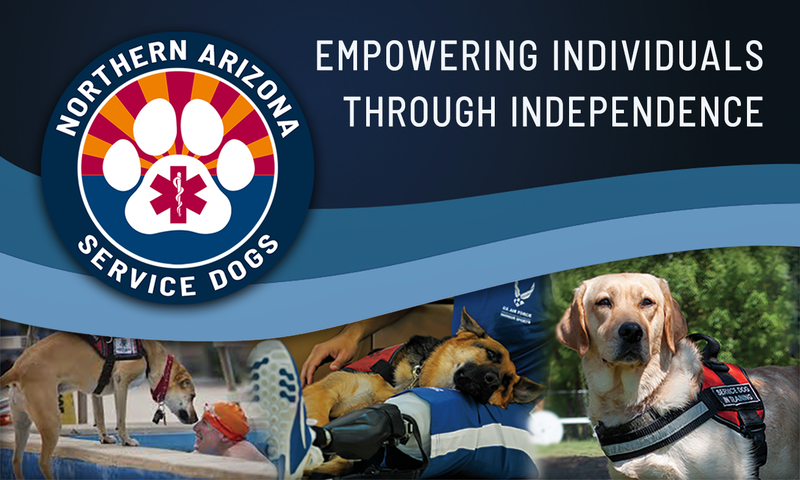 Northern Arizona Service Dogs prides ourselves on helping educate the public, as well as a diverse array of people who come to us for assistance with their special needs and situations. This includes providing service dogs information about how to responsibly and legally obtain a reliable, highly trained certified service dog. However, please understand that we are not medical professionals and therefore cannot diagnose disabilities, or prescribe a service dog as a remedy for a particular disability. Although Arizona law does not require a physician to prescribe a service animal, we highly recommend obtaining advice from a qualified healthcare professional before embarking on service dog ownership. We will gladly work with your healthcare team to provide you with a service dog that meets your needs based on their professional recommendations. We also adhere to HIPAA federal privacy laws, and never share your personal information with anyone. Also, please understand the service dogs information on this website is not meant to replace professional health care support services, the guidance of a licensed physician, or retained legal counsel in the case of rights violations. We are always happy to lend our expert insight into owning and caring for a service dog, but we cannot provide official legal or medical advice otherwise reserved for healthcare and legal professionals where your rights regarding a service dog under ADA guidelines is concerned. We welcome you to contact us with any questions you have about this disclaimer.